Incidents good or bad do take place in our lives. But what bother most are the bad ones. Hence the bad incidents need to be kept account of, and should be recorded on time, and reported on time. The exact reporting of what happened, how it happened, when, and the results or circumstances, helps people or authorities examine things and causes about the incident, and come to a conclusion about the responsible elements. 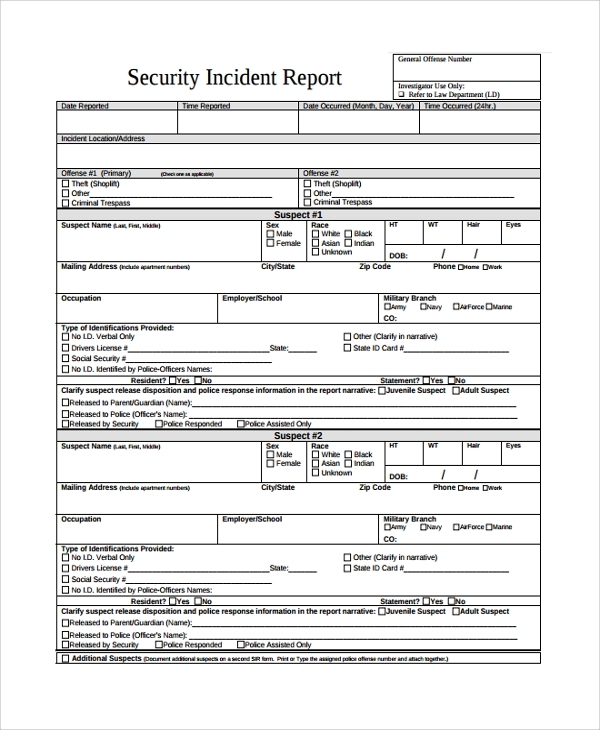 The Incident Report Templates makes this kind of legal and security reporting easy. 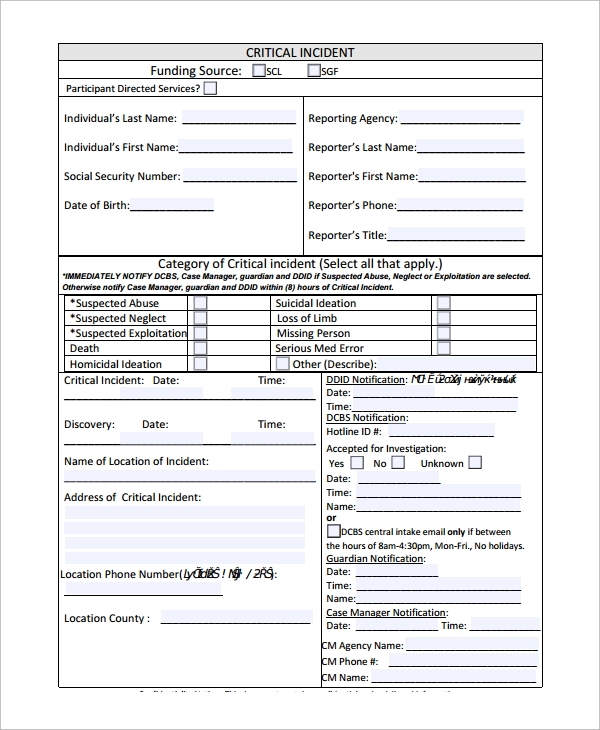 The critical incident reporting form is one format, where you report a critical incident while making a list of causes, probably reason, your understanding of the responsible element, the things which look after the situation, etc. All probable reasons, the results, the visible evidence etc are recorded into this format and this way the form is made ready by filling up the details, the checkboxes etc. 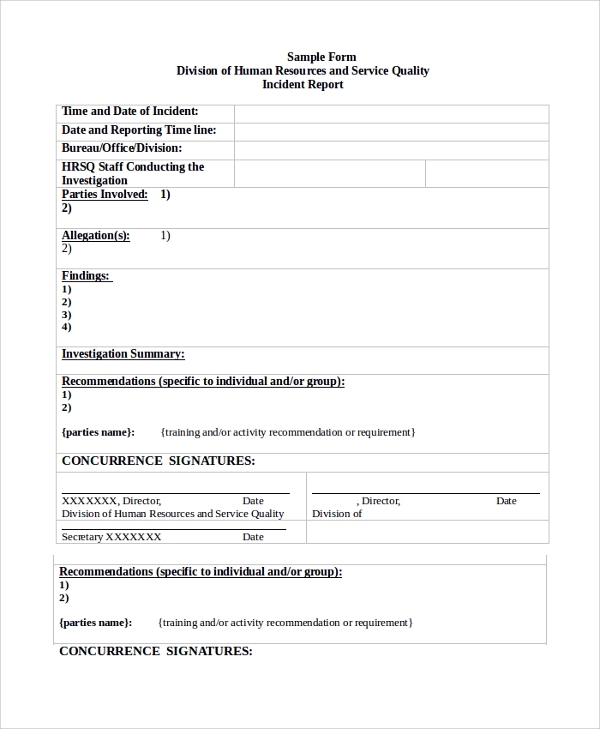 The security incident reporting form is used in places where security camps, guards or shelters are formed. In all such places, forms are provided to the security staff to report and identify probable causes of security threats, breaches or incidents using the form. The form contains important fields that make the reporting easy. 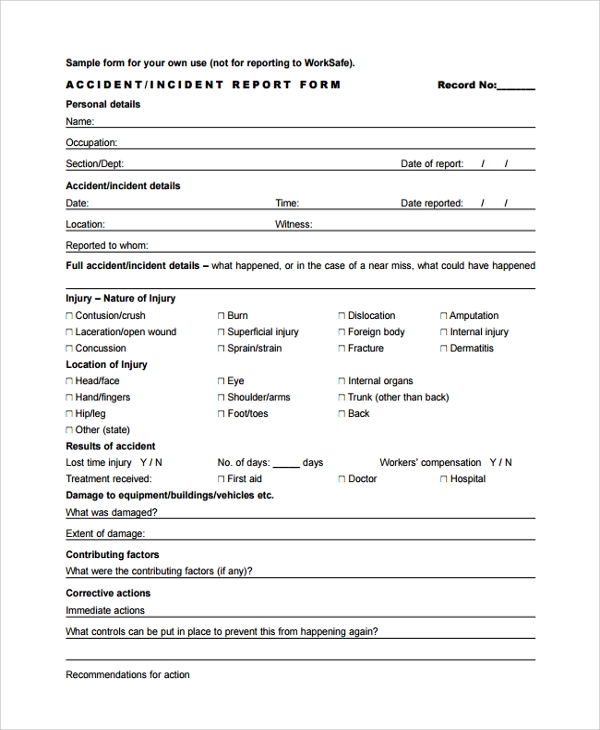 The accident incident reporting form is made to report accidents. If there is an accident, then the form can be used by the police in charge, the security in charge, the supervisor etc on the place, office, premises, road etc. 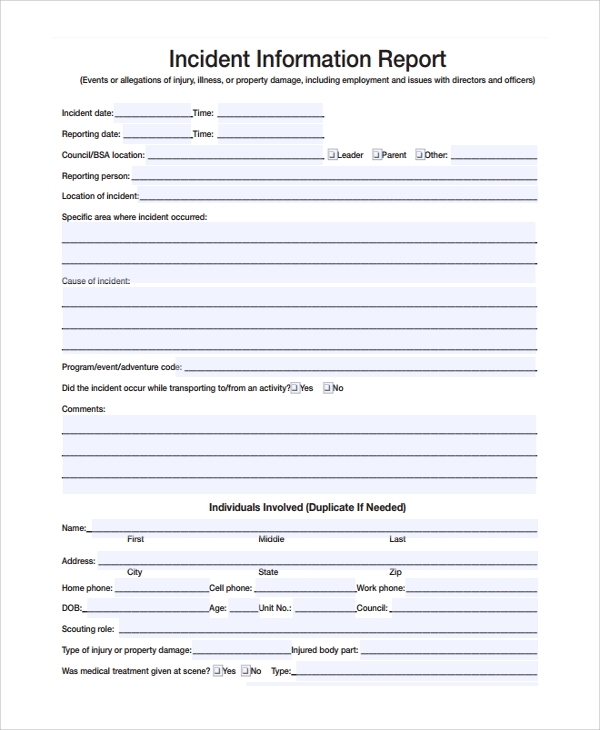 This form gives the exact format to tell all important sightings and recordings about the accident or incident. 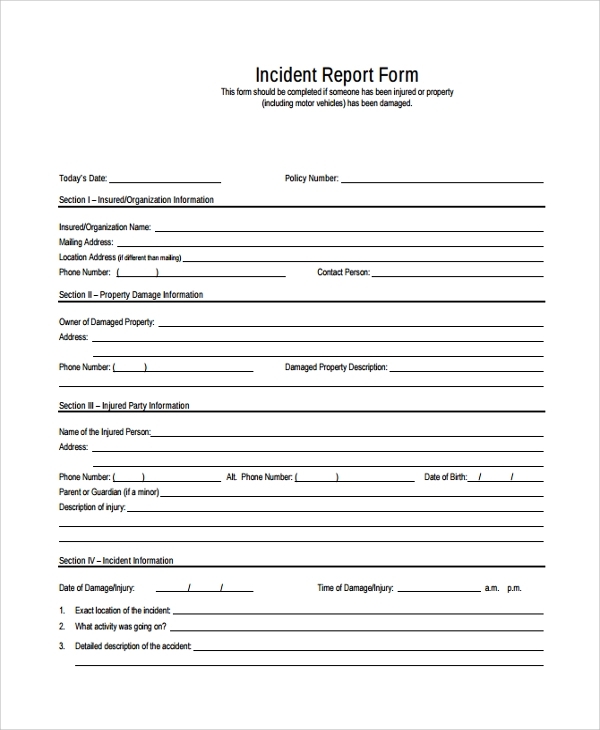 The incident Report Template is needed to make things systematic when you are reporting an incident. An accident or bad incident often causes enough confusion, chaos, and problematic situation. This is more aggravated with the loss of life, property, damages etc. In such situation, it’s difficult to concentrate and think of points to note about the incident with a full focus in reasons, causative agents, suspects etc. Therefore this form has been designed, and available in a template form, and can be downloaded from online resources. 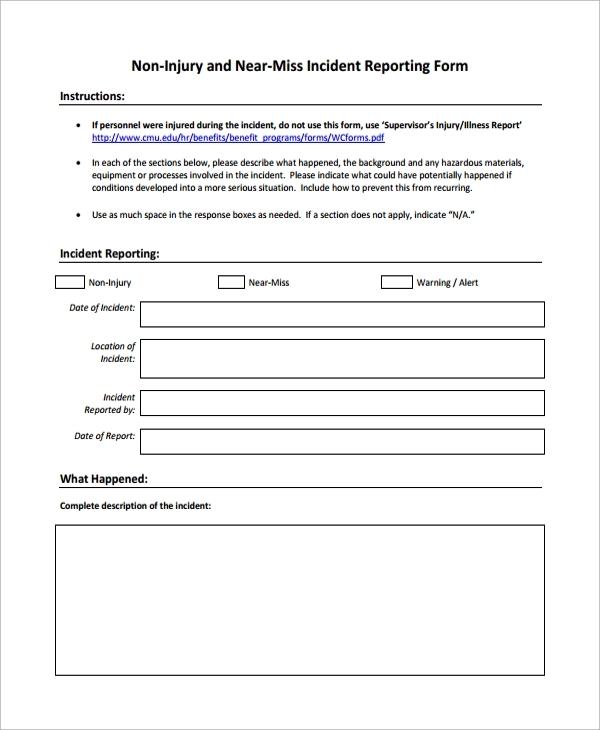 This helps you get a ready format to work on when you are reporting some incident instead of making points on the spot with a blank sheet and pen. What are the Benefits of using the Incident Reporting Form? How to use the Form? Using the form could not have been simpler. You just have to make sure that you are getting the right form which is needed for the reporting. 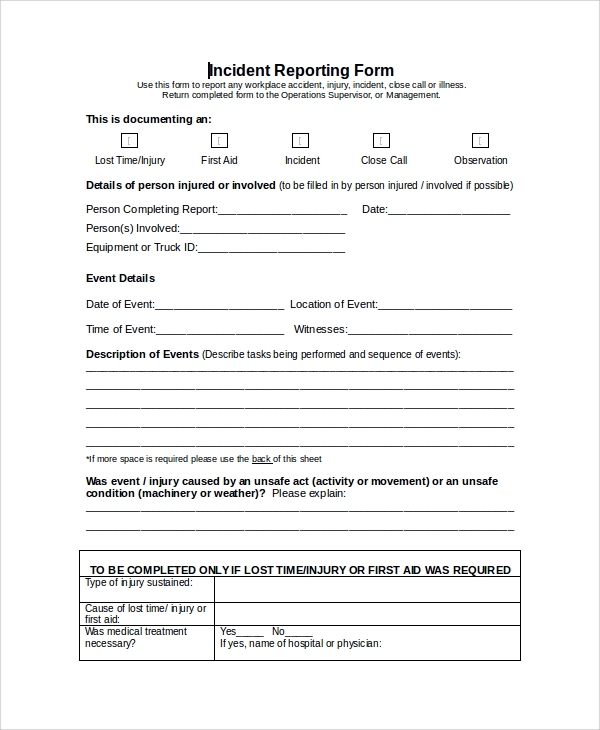 There are several types of incident reporting forms, and you must get one that is apt for you. In most cases, it’s a simple form format. There are blanks beside set questions, and some checkboxes or multiple choice questions. Your job is to study the incident and start filling up things. This way you will be able to complete the injury report form in short steps, and this won’t take much time either. 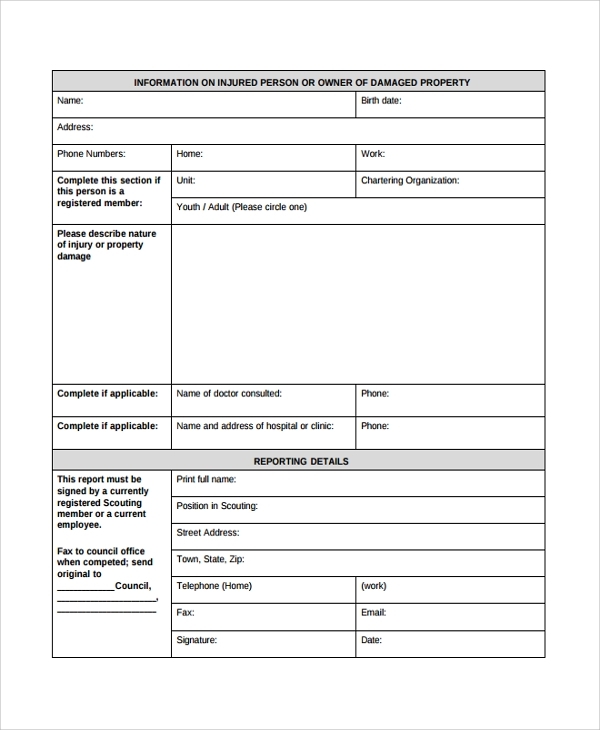 To record and report the happenings in an incident, or accident, it’s good to get a preset accident form. This helps you save time and lets you record all details which will be needed later by avoiding the on the spot confusions due to the incident aftershocks. 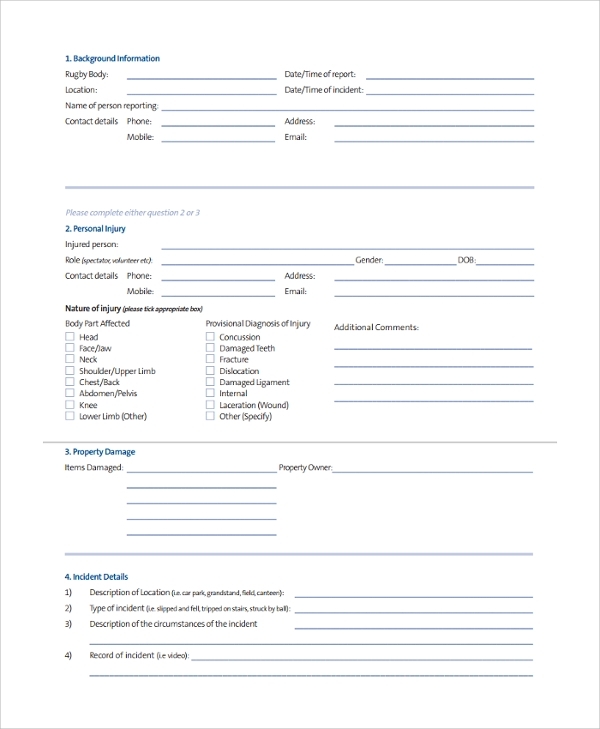 These forms are available online for free downloads, and getting a copy makes things simple in case of crises.